I realized something, seeing Finding Neverland almost thirteen years after its release and probably ten years since I last sat down to watch it; even great films have flaws. Of course that’s true, and of course that seems pointless to write down, but this movie is a good example of something magical that isn’t near perfection. Every once in a while a film is brilliant in entirety and in its pieces, but that’s rare; most grand pictures have a few warts under the surface. But that doesn’t stop them from being excellent, that shouldn’t stop you from loving them, and in the long run it doesn’t really matter, as long as the emotion overrides the bumps. 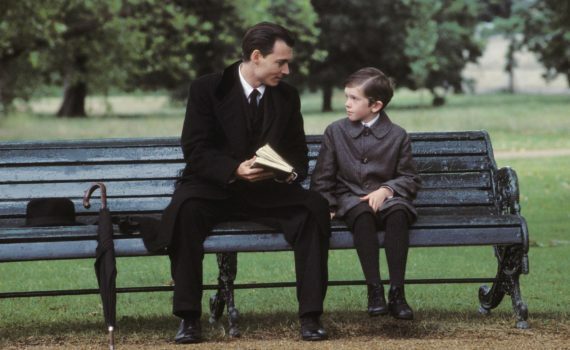 After three or four viewings, Finding Neverland does reveal its problems, and while that might stop it from being the best movie of the decade, it doesn’t stop me from enjoying the moment and the heartbreak yet again. This is the story behind J.M. Barrie’s play, his characters, and the story that would capture the imagination of the entire world for what has already been over a hundred years, and for what will be hundreds more to come. Barrie was a playwright, a lord, a wealthy man, but lived in an unhappy marriage that had produced no children and no satisfaction. His latest show was a flop, he needed fresh ideas, and he needed to reconnect with the joy of writing which had led him down this career path in the first place. After a chance encounter with the Llewelyn Davies family (a mother and four boys who had recently lost their father), Barrie was inspired to tap into his own youth, to remember what it was like to be a child full of wonder and adventure. Peter, who couldn’t find a way to grieve the death of his father, struck Barrie’s heart most of all, and led to his writing perhaps the best story to ever grace the stage and the page. If watching Finding Neverland doesn’t at least choke you up a bit, your heart has grown cold. This film is full of magic, love, imagination; basically every wonderful thing that makes Peter Pan the amazing story that it has always been and will always be. It’s incredible how long this story has lasted, how many different directions and media types it has shot toward, how many of us love it, and this movie does that justice in every way. A bit of romance, some lasting lessons, a look into the past; everything you could ask for from an evening of entertainment. Now, after all these years and viewings, I did notice a few flaws: Depp is a bit one-note, his scenes with the grandmother are poorly written, Winslet’s character is quite over-dramatic. But you’ll find, if you’ve never seen the film, that most of that doesn’t matter, that the magic of Pan shines through regardless.